We know that you are deeply curious about visiting one of the most mysterious places of the world, Cappadocia.Plenty of questions come to travelers mind like How was formed the fairy chimneys or How people carved the chimneys adroitly and Who built these underground cities? Even the creation of chimneys explained by scientific facts can’t keep us from thinking was it heaven of the fairies or not. What are Fairy Chimneys ? Conic mass of tuffs that abraded by the of rain, winds and floods. Also rounded rock bodies usually exist on top of them. Formation of Fairy Chimneys – How are Fairy Chimneys formed? The chimneys are a result of a geologic process that began millions of years ago. 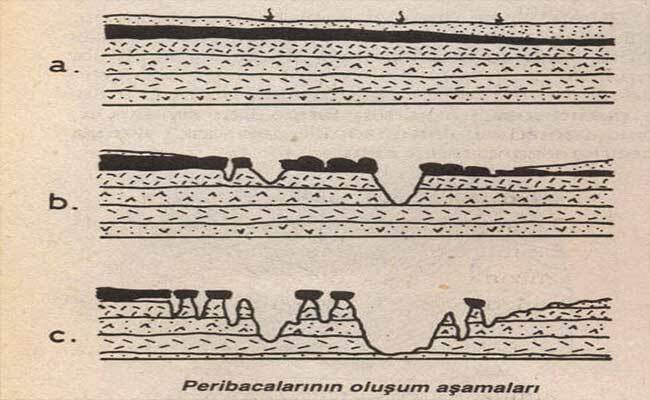 At that time Mountain Erciyes ,Güllüdağ and Hasandağı were active volcanos also the Cappadocia area was an inner sea as it is understood from the fossils of sea creatures found in archaeological excavations. Erupting lava went down through the plateaus and dried this inner sea , lakes and streams.Tuff layer was formed on dried surface which thickness about 100-150 meters.Layer includes both soft and hard materials like volcanic ash , clay, sandstone, and basalt. This pile of lava has undergone some changes because of the Kızılırmak , flood from valleys and winds. Floods were strengthened by lack of vegetation and impermeable layer of tuff and caused structural change in the rocks. Nature works in this region for centuries as an artist, as a sculptor and work with the hard rocks to protect itself from the flood waters formed unique capped fairy chimneys. Strabon the famous geographer of the Roman antiquity drew the borders of Cappadocia for the first time in history. Starting from the Taurus in the south, Eastern Black Sea coastline in the north, Aksaray in the west and Malatya in the east, gave the name Cappadocia. 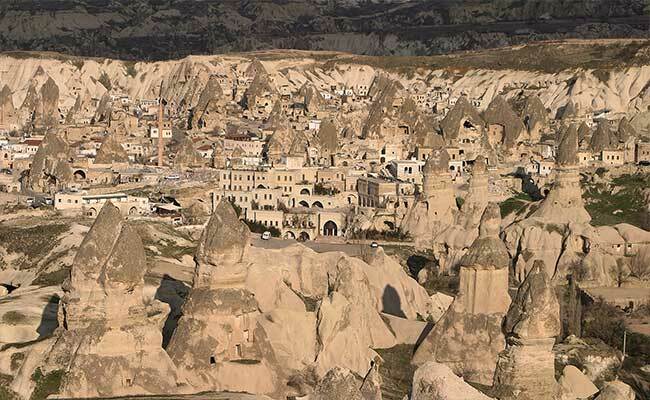 And the Avanos,Ürgüp,Göreme,Uçhisar and Ihlara also belong to Cappadocia and they are known as Rocky Cappadocia Region. Cappadocia has seen various of civilizations since the formation of fairy chimneys. The interior parts of chimneys which are the natural buildings of the region were carved in the Paleolithic period where the first human settlement was located. After the period of Hitits, in the 3rd century ,buildings used as shelter and temple. Fairy Chimneys witnessed the resistence of Christians against the Arabic raiders until the 11th and 12th century. Due to the tufface structure,extended and carved a little more by the time, even painted frescos at the time of using as a church. Miracle of the formation of fairy chimneys inspired people to believe also this region is visited by aliens. As a general information about fairy chimneys that most of them formed of heavy rock bodies on conic stems. The biggest share in the formation of fairy chimneys falls to their hats. Because the parts of the hats are harder than the field, it provides protection of the body which is rising in the form of cone and which is relatively soft. The body parts of the fairy chimneys consist of tuffite, volcanic ash and tuff, while the hat parts consist of hard, durable rocks such as ignimbrite and sarcophagus. That’s why hard hats weigh down their weights to make tapered bodies more resistant to wind damage.Tuff in the conical body prevents erosion and controls the height of chimney. We won’t be lying if we say existence of chimneys or their durability depends on the resistence of the hats. In addition the fairy chimneys, there are mushroom shaped , columnar and pointed fairy chimneys. Diameter of fairy chimneys are from 1 meter up to 15 meters. Those that are out of this interval are not considered as faiy chimneys. It’s like a miracle presented by nature that gray and white fairy chimneys are standing upright despite their million years of age. Natural buildings in some places in the world are similar to fairy chimneys but nowhere that it can be found much often that. Therefore, Cappadocia Fairy chimneys are shown as one of the 7 wonders of the world. Predicting how long it will resist against time is like knowing the exact time of the earthquake. Even though it is considered to be formed again in the future again,changes in the nature and corrosive factors are the reason of decreasing the resistence of chimneys. 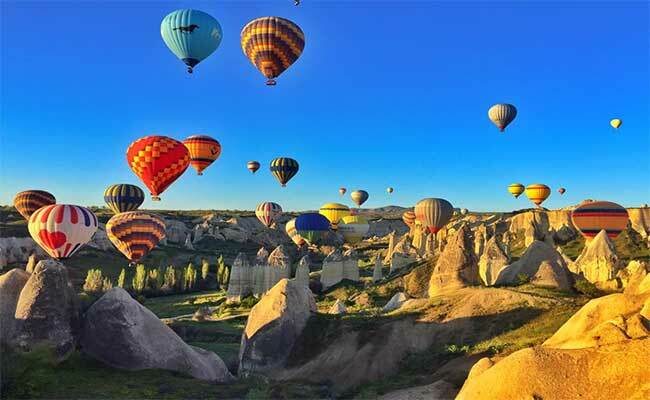 Where’s the fairy chimneys in Cappadocia? There are thousands of fairy chimneys exist on the tuffaceous volcanic soil of Cappadocia. Mostly observed in the valleys of the triangle Avanos-Ürgüp-Uçhisar. For instance you can observe hundreds of fairy chimneys in Soğanlı Valley which famous of rag dolls. We can call the Çat town which is just 7 km from Nevşehir, as forest of chimneys. You can watch the colors left by sun on the chimneys that are leaning on the slopes. It’s possible to walk between the mushroom chimneys which located in the Paşabağ Valley on the highway of Avanos-Göreme. But if you are asking where to see the most of them , we just say “go to Zelve”. Old fairy chimneys have millions of stories throughout their silent lives.And there are many available roadsides and hilltops in Cappadocia. You’ll definetly hear the legend of fairy chimneys reaching up the present while your trip. A long time ago a hardworking peasant lived in one of the villages in Göreme.Grapes from the vineyard shaded by the chimneys and his pigeon lofts were symbol of the abundance. Wanted to go to plantation early in the harvest but he slumped down near a fairy chimney because he got no strength. At the same time he lamented and said what if birds destroy my plantation what if flood comes up. He suddenly saw many of fairies coming out of the chimneys with torches in their hands. Fairies gathered crops and grapes then carried them to the storage, disappeared before dawn. The old man thought he was dreaming but help of the fairies kept helping the man in the next days.Village residents could not believe the abundance in the old man’s field and could not find out what really was it about.Old man died one day with his secret , but the fairy chimneys kept the secret all the time.